CM Magazine: Dead Bird Through the Cat Door. (A Megabyte Mystery). Dead Bird Through the Cat Door. (A Megabyte Mystery). Vancouver, BC: Gumboot Books (Available from the author at janmarkley@jankarkley.com), 2010. My thigh had gone numb from the weight of Yin the amazing bird killer turned lap cat. We called her Yin because half of her face was white, with a black circle around her eye, and half was black. Her body was a combination of black and white patches. We came up with the name when we were five, but later found out that Yin and Yang are opposites within a whole -- kinda like Jane and me. We're identical twins, but in some ways we are exact opposites. "Wait a cyber second. None of this has anything to do with the crazy guy with the net." [Jane] slammed down the lid of the laptop and stared at me like I'd know the answer, just because I was the two-minutes-older twin. Pressure was on. I tried to avert Jane blowing a gasket. She had a long simmering fuse, but when she blew -- look out. I scratched Yin under the chin. "What would a cat do?" I mused, listening to her purr. "Go to where the birds are. That's it, we'll go to where the birds are." I jumped up and Yin sprawled onto the floor. She squawked. She was none too happy with me. "Cat treats for you later, Yin." I swivelled toward Jane. "Mom wants us to volunteer. So we'll volunteer at the Wildwood Bird Sanctuary." We were twelve years old. Too old for day care and too young for jobs. Just the right age for mysteries. Dead Bird through the Cat Door begins with -- wait for it! -- a dead bird brought in through the cat door by the twin's cat! After funeral rites (for the bird that is; the cat is forgiven for being true to her nature) have been observed, the twins attempt to take their minds off the mishap by biking out to the nearby bird sanctuary where they see the director of the centre inciting his own cat to kill yet another bird! "One down, three thousand to go," he says. This behaviour makes no sense to Jane and Cyd, our 12-year-old mystery hounds, and they dive, or fly, into solving the puzzle which has so suddenly fallen into their lives. 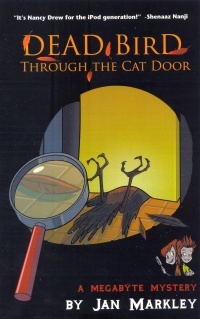 In a riotous mixture of Macbeth quotations, odd scientific facts, the good effects of pet-visiting in senior-citizen housing, cat shows, and wild-life sanctuaries, the twins sleuth their way to a solution to the mystery, foiling the bad guys and saving their cat from the villains' hands. Does this sound a bit unlikely? Of course, but it's all part of the fun. Jane and Cyd put all their deductions onto their blog, get away with blatant snoopiness, have very stupid -- although intellectual and scientific -- parents, and very soft hearts, especially Jane. Cyd makes a great show of being the pragmatic, hard-headed, older (by two minutes) twin, but she, too, gets caught up in saving the birdies from the evil grown-ups. Of course, they do just that, with the exception of the unfortunate birds killed when the stolen cats are released en masse, but that kind of slips by. Cats will be cats, after all. All this is accomplished in a rip-roaring, punny manner that I suspect nine-to-eleven-year-olds will find irresistible. Older kids, maybe not. I found it got a bit wearing, but then, I've not been 11 for some time. Jan Markley has her target audience firmly in her sights, and for them, she hits right in the gold. Now retired, Mary Thomas lives in Winnipeg, MB, and looks forward to her grandkids getting to the YA stage of reading.